Our experienced team has an excellent understanding on Garden Turf and our efficient delivery service in Cheshunt is fast, straightforward and dependable. We’ve been delivering our diverse range of landscaping products in and around Hertfordshire for many years, and our specialist team has the skills and the facilities to deliver your items wherever you like, whether that’s on your driveway, on a fairway, in your back garden or at a building site. Over the years, we’ve built up a thorough understanding of what each customer requires, and we regularly invest in the latest equipment to continuously improve our delivery processes. Our fleet of 32 tonne lorries with telescopic Manitou forklift trucks on the back enables us to place your landscaping products exactly where you want them, while our on-site chiller units help us supply fresh turf grades at all times - even in temperatures well above 30°C. 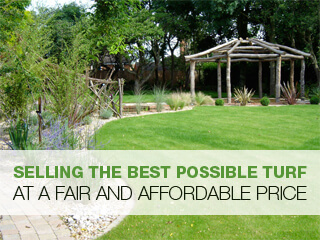 To speak to a member of our team today about our Garden Turf, give us a call today on 01234 714555 or 01727 821 765. As a totally independent business, we only supply landscaping products from reputable producers. We supply fully finished, first class turf from established growers to a huge range of clients, including homeowners, builders, landscapers and green keepers in Hertfordshire. We process orders efficiently, usually by telephone so that we can then get it logged into our system and give you an accurate delivery time. No matter where you’re located in Cheshunt, you’ll always be guaranteed timely, fresh deliveries. Our dedicated team is always on hand to offer advice and guidance related to Garden Turf, and you can see just how our quality products have helped our previous clients by reading thorough our testimonials. Whether your outdoor space requires premium rolls of turf, top dressing products, multi-purpose grass seeds or nutrient-rich bark mulch, we can meet your requirements. Our high quality equipment allows us to meet our customers’ demands all year round, so the British weather and busy traffic never prevent us from delivering a first class service in Cheshunt. We have two depots and we’re equipped to handle large deliveries throughout the UK, so if you require Garden Turf in Cheshunt then get in touch with a member of our team today on 01234 714555 or 01727 821 765. Alternatively, you can send us a message using our online contact form, a member of staff will then be in touch to deal with your request.